Two more history seeds for you! 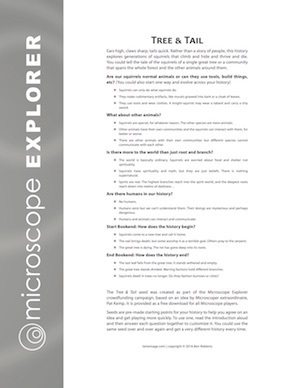 These were created as part of the Microscope Explorer kickstarter, based on ideas requested by generous backers, but they are provided as free downloads for all Microscope players to enjoy. In the War of Secrets seed, a world-shaking truth lurks, guarded by some and sought by others: Aliens hide among us. Our royal line is descended from our hated enemies. We evolved from monkeys. But even if the truth is revealed, is it believed? Or is it misunderstood or warped into myth, hidden in plain sight? The secret may be exposed and then forgotten or suppressed over and over again as your history ticks down the centuries. Instead of a history of humans, the Tree & Tail seed explores a community of squirrels that climb and hide and thrive and die in the Great Tree and the forest beyond. Tell a story of ordinary squirrels or tiny furry tool-users, squirrel knights and squires defending their leafy realm. Was this seed inspired by Pat’s legendary squirrel Microscope Union game? I’m guessing yes. 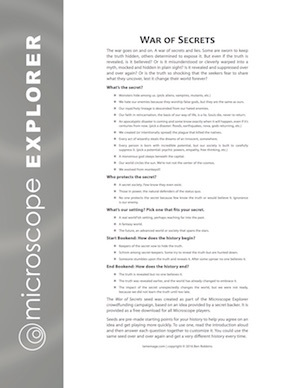 Thanks again to the fantastic supporters who made Microscope Explorer possible!